An accident this morning at the intersection of Barker Cypress and Spring Barker sent a 12-year old Goodson Middle School student to the hospital. The young man was riding his bike to school when he was struck by a Ford Mustang. A ground ambulance took the boy to Cypress Fairbanks Medical Center; his injuries were not listed in Channel 2’s article. 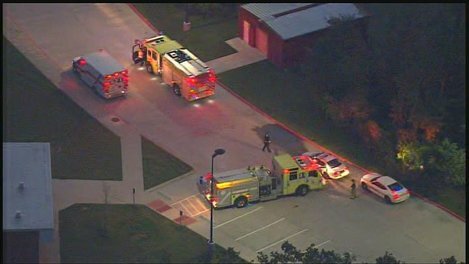 A Life Flight helicopter responded this morning to a pedestrian accident involving a student at David High School in Aldine Independent School District. 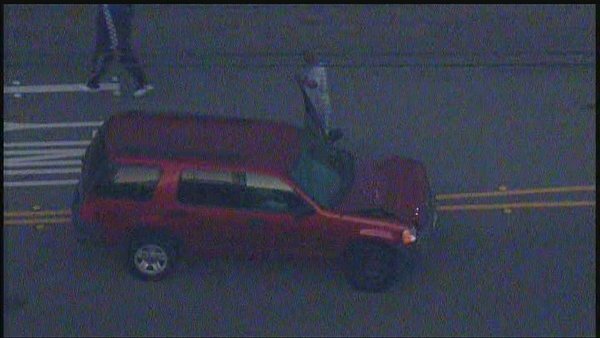 Channel 2’s report states the student was walking along Spears-Gears Road near Bartlett Cove when she was struck by an SUV at around 6:30 a.m. A neighbor who did not witness the accident remained at the scene and held the girl’s hand until help arrived. 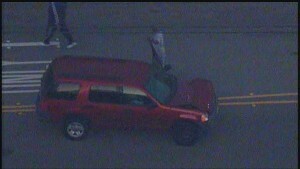 Photographs posted to KHOU’s web site show a red-colored SUV with significant front end damage. 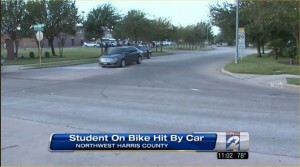 Hopefully the student is not seriously injured. Related links: automobile versus pedestrian accidents; injuries and automobile accidents. KHOU says that a HPD bike patrol officer was knocked down and injured in an accident in Kingwood. A pickup truck was turning into a gas station on Kingwood Drive near W. Lake Houston Parkway when the officer, who was riding a bicycle, was hit. He was transported to hospital, fortunately with injuries that were not life-threatening. 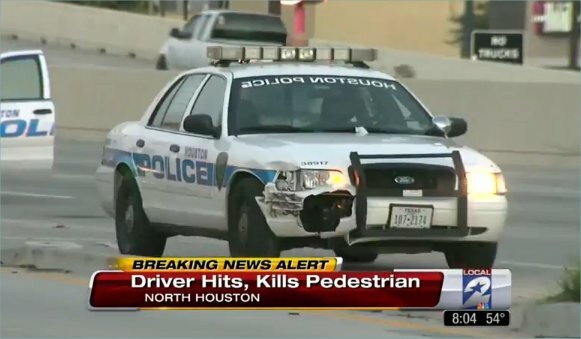 The article doesn’t say if the officer was on duty at the time, but presumably not given the accident happened in Kingwood. 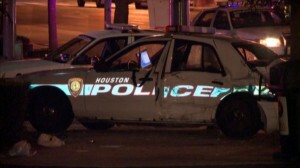 One person was killed in an unusual series of collisions on the North 610 Loop at Ella Boulevard early Sunday morning. Two vehicles collided around 3:30 a.m. and Houston Fire Department was dispatched to respond. One of the drivers got out of his vehicle and was hit by a third vehicle heading eastbound on 610: he was pinned between two vehicles and killed. A passenger from this man’s vehicle then tried to run across the freeway to get help, and he was hit by a fourth vehicle causing a leg injury. Channel 11’s report is here. Channel 2’s story provides a bit more detail, and a slightly different version of events. According to Channel 2, the eastbound vehicle rear-ended a black-colored Chevy Impala, which caused the Impala to spin out across the freeway and hit a Toyota. The vehicle that struck the Impala then fled the scene. 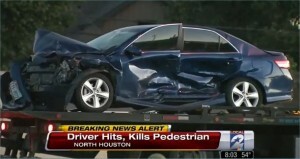 The driver of the Toyota then exited his vehicle, complaining of a head injury, and lay down on the roadway. An additional vehicle, a Honda Accord, then came upon the scene and struck the man, killing him. 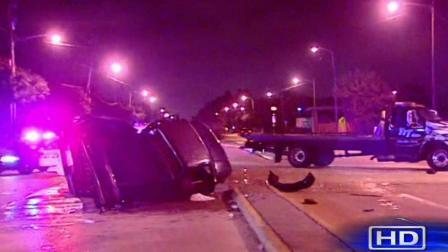 Investigators say the Honda driver was driving drunk. Another vehicle was following the Honda, and when that driver saw his friend had been in a wreck, this man ran across the freeway trying to help and was hit by a car. 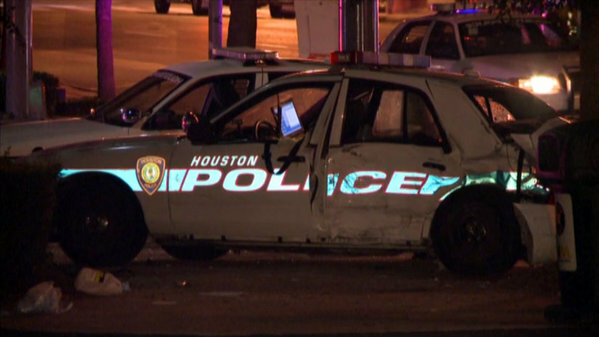 And of course, once police arrived and were handling the accident scene, another drunk driver crashed into a police patrol car. A man is extremely lucky to be alive after crashing into steel girders being carried on the back of a big rig that was backing out. Channel 13 reports that the wreck happened on FM 529 near Paddock Bend Drive. 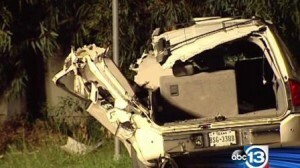 The impact ripped apart the driver’s side of the man’s white-colored SUV, possibly an older model Suburban. 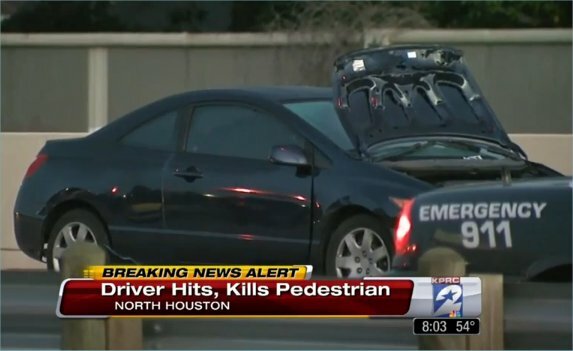 The man was critically injured. 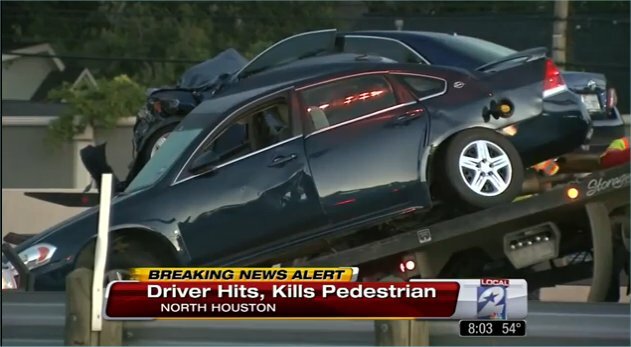 Most likely the 18-wheeler will be faulted for the collision, since a vehicle backing onto the main travel lanes would have a duty to do so safely and without interfering with traffic that has the right-of-way. If you have been seriously injured in an accident with an 18-wheeler, large truck or other commercial vehicle, it is very much in your interest to have an excellent understanding of your legal rights and how the injury claims process works. Insurance companies dedicate tremendous time and resources to investigating what they call “large loss claims”: bad accidents where the injured person is seriously hurt, and the insurance company has a large policy covering the at-fault vehicle. Make no mistake: they are investigating to see if there is a way to avoid paying some or all of the claim. Smith & Hassler has an excellent track record of handling major injury and wrongful death claims involving commercial vehicles that dates back to 1989 when the firm was founded. Visit us here to learn more. 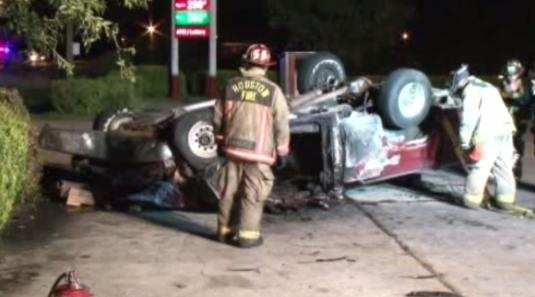 A car and a pickup truck collided early this morning in a major accident at an intersection on Bennington Street in Houston. 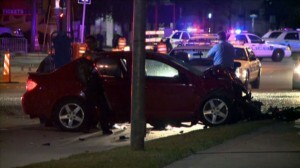 The crash happened around 2:30 a.m., there were two men in each vehicle. Police found beer bottles at the scene but it is not reported whether drunk driving was believed to be a cause of the wreck. The driver of the pickup truck was seriously injured. Several people were injured in a four vehicle accident that involved a METRO bus. Around 1:30 p.m. Tuesday afternoon a METRO bus rear-ended a black colored car on Almeda Genoa, pushing the car into two other vehicles. The car’s driver and two passengers were transported by ambulance. The commentary to Channel 2’s story on the accident makes for some interesting reading. 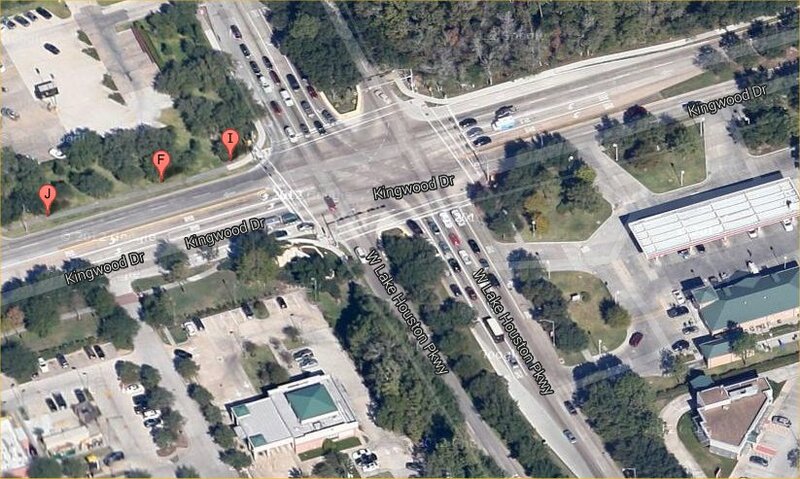 A two vehicle accident on Almeda Genoa Road in Houston claimed two lives over the weekend. Around 2:45 a.m. on Sunday morning a car pulled out from a stop sign on Martin Luther King Boulevard and attempted to turn right onto Almeda Genoa Road. The car apparently interfered with the right-of-way of a red or maroon-colored pickup truck heading westbound on Almeda Genoa, causing a collision. The car was knocked in a ditch by the impact and the pickup rolled over, coming to rest on its roof before catching fire. Tragically the driver and passenger in the pickup were unable to exit the vehicle and were trapped inside: both were killed. The car driver was taken to Ben Taub in serious condition and police are continuing to investigate. Channel 2 Houston’s story is here. H.P.D. Sergeant Ignacia Izaguire told Channel 11 News that police department policy requires detainees be belted while they are being transported (which makes sense, because if they are handcuffed they can’t fasten their own seat belt). An investigation will be conducted to determine if that policy was followed by the 15-year veteran officer who was driving the police car. Typically police patrol units have a camera inside the car that records occupants riding in the back seat, so presumably a review of that camera footage will be a big part of the investigation. It is difficult to imagine how the detainee could have been completely ejected from the police car if she were properly seat belted. The woman had been taken into custody earlier in the evening on the grounds of Hobby Airport because she was determined to be a hazard to herself: she was being transported to a facility to sober up. 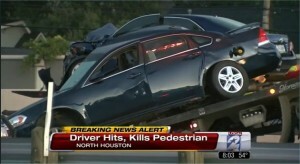 Channel 11 reports that an accident on I-45 North this morning involved more than a dozen vehicles. The crash happened in the northbound lanes near Little York around 6:32 a.m. Of course, traffic in both directions ground to a halt.